Why is it that many of us say we feel better when we are around nature? One reason is that plants actually make us feel better; less stressed, more productive and healthier. 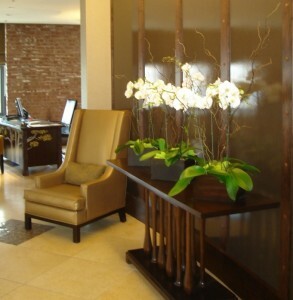 If you look at some of the interior plant displays in commercial buildings in San Francisco or the East Bay you can’t help but feel good, looking at their color and beautiful foliage. Based on the findings below – it seems clear that we can’t afford not to have plants in our homes and commercial buildings. Science is clearly telling us that interior plants are good for our health! A recent study by Dr. Lohr from Washington State University found that the subjects were 12% more productive and less stressed when they worked in an environment with indoor plants versus no plants. 25% less dry facial skin than subjects working in a building without indoor plants. This is a great statistic for retailers: subjects in a study directed by Engel et al rated the quality of retail products on display 30% more favorably and were willing to pay 12% more for goods in an environment with plants than an environment without plants. When we shop in retail areas with “tree” versus “non-tree” environments we visit more frequently and stay longer. Are you looking to muffle noise in the workplace? Plants can be used to absorb sound. Clustering any type of green plants will make more of an impact in the workplace than just a few scattered plants. Even though any type of plant will work, plants with a lot of leaves, such as Ficus Benjamina or Pathos will do as much as carpeting to reduce noise.